Named after the historic Ranthambore fortress and known for its national Park, Ranthambore is beautifully located in the Sawai Madhopur district of Rajasthan state in India. Visited by large number of tourists and wildlife lovers, Ranthambore is famous for its tiger population and has been given the status of one of the Project Tiger Reserves of India. Besides if you are visiting Ranthambore and looking for an accommodation then finding one is not a problem here. Indiahotelandresort.com offers to give you online information on hotels in Ranthambore in Rajasthan,India. With hotels and resorts spread all over Ranthambore, finding an accommodation is not at all a problem here. From luxurious star hotels to affordable and economical budget hotels you will easily find all kinds of hotels in Ranthambore. Hotels in Ranthambore promise its guests with luxurious stay and warm hospitality that is sure to make their stay here a memorable one. The hotels are not only well facilitated but are also reasonably priced taking care of their budget requirements. So what are you waiting for, plan a tour and book a hotel and get ready for an experience of a lifetime. 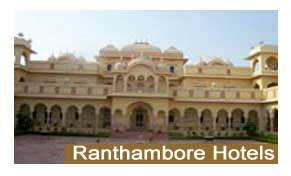 Indiahotelandresort.com offers to give you online information on hotels in Ranthambore in Rajasthan, India.